Before becoming a professional wrestler he practiced amateur wrestling. He won a National Sub-Championship in olympic wrestling in 1964. His professional wrestling debut was on November, 1969 against Black Terror. He was Angel Blanco before Angel Vargas, he suffered an injury which left him innactive for a while. 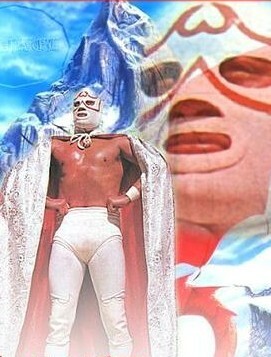 After he learned that there was a new Angel Blanco he decided to change his name as Demonio Blanco. After his mask loss against Mano Negra he had tours in California, Texas and Japan. In 1978, Rivaldo Morales offered the name of Robot C3 to return to Mexico with that character. He propoused Mario Alcala to become Robot R2. They had presentations under those characters outside of Mexico. However, the Commission of Mexico did not allow him to wrestling under that gimmick due to the recent loss of his mask as Demonio Blanco. The characters went to Barba Negra and El Rebelde respectively. 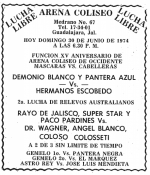 He founded his own gymnasium Gimnasio Demonio Blanco and Arena Demonio Blanco in Puerto Vallarta. Moreover, he adopted another character Fantomas. That gimmick was heavyly based on the comic book character with the difference that the character was a magician. He used to perform magic tricks in the ring. He continued his wrestling career until 1992 when he retired. This page was last edited on 24 July 2017, at 16:55.